You will be saying “Lights! Camera! 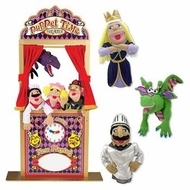 Action!” when your kids perform a puppet show with the Melissa and Doug Deluxe Puppet Theater with Smoulder the Dragon, Knight and Princess. The puppet theater is wooden and has been designed with room for two puppeteers. Safety has been built into the theater as the base has a non-tip design. The stage has theatrical graphics, velvety curtains and a clock with moveable hands. This is a must-buy item at Today’s Concept for the young puppeteer in your family.